When you buy a liquid fluoroelastomer product from Pelseal® that is labeled with the Made with Viton™ seal, you can be certain the product contains 100% pure Viton™ fluoroelastomer. 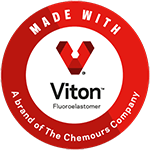 The Chemours Company FC, LLC is the only manufacturer of Viton™ fluoroelastomer polymer. As a licensee, Pelseal signed a formal agreement that grants us the right to use the Viton seal on our products that we label with the official Viton™ seal. Only a select group of manufacturers participate in this Viton™ Seal Program.